Heavy-duty blenders -- often referred to as professional-grade or commercial-grade blenders -- are restaurant-quality blenders that are extremely versatile appliances that can do what general-use blenders do much faster and with better results. They're extremely popular with those who want to make their own flours or butters, a task they can make effortless. A blender in this price class can replace a food processor, coffee grinder, grain mill, and a juicer -- they do it all. That might be more than many people need, however, and the $400 plus that many of these blenders cost might be more than some people want to pay. If that describes you, or you're unsure, take a look at our reviews of the best blenders for some less pricey, but still very good, options. Appearing at the top of virtually every "best of" list we saw, and dominating professional tests and user reviews, is the Vitamix 5200 (Est. $500). It has 10 speeds as well as a variable use setting for even greater control, and it gets raves for everything it does -- the only con we saw anywhere is that some think it's too noisy. But others say it's no louder than any blender. All agree that the Vitamix can handle anything you throw at it, churning nuts into nut butter, kneading dough, grinding coffee and spices, and even turning grains into flour. It not only can blend hot ingredients, it can heat up cold ingredients in about six minutes to make soups and stews right in the blending container. The Vitamix excels at traditional smoothies, but can also handle "green" smoothies made with hard fruits and leafy veggies, an area where most blenders tend to lag. A number of owners are initially underwhelmed by the appearance of the Vitamix blender. It's decidedly low tech, with just a dial and switch, unlike some blenders with their push buttons and LED lights. But that retro styling is part of the reason this blender will last a lifetime, experts say. Vitamix backs up its reputation with a seven-year warranty. In addition, that basic dial operation makes the Vitamix 5200 super easy to use, and, although it's not dishwasher-safe, the jar can easily be cleaned by whirling soapy water and rinsing. Owners say it's one of the simplest blenders they've ever used, in spite of its superior performance. Five color choices (black, brushed stainless, platinum, red and white) are offered. Now, if you'd like to take a moment to look up the search term, "Vitamix versus Blendtec," go ahead, we'll wait. It's one of the hottest topics in the heavy-duty blender market and there are plenty of comparison articles and videos that all come to different conclusions. That's because Blendtec is also a great, heavy-duty blender and the Blendtec Designer Series WildSide Blender (Est. $500) is a more-than-worthy runner up to the Vitamix. 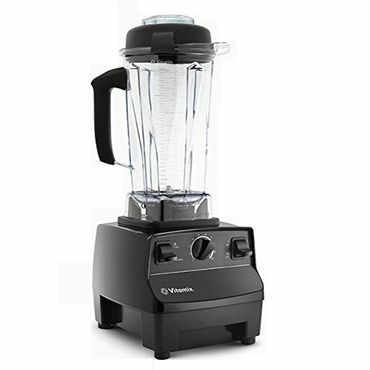 In fact, it can do anything the Vitamix can do and, as a video on the Blendtec website so graphically illustrates, it can even pulverize your electronics, if that's the way you want them to go. All joking aside, the only reason Blendtec is not in our top spot is simply because it isn't included in as many professional tests, and when it is, it tends to be ranked lower for things like convenience (ease of use) and noise, not performance. All things being equal, the Vitamix tends to come out on top in most of the comparisons we've seen; however, if you have a small kitchen, you might want to seriously consider the Blendtec WildSide since it has a smaller footprint than the Vitamix 5200.